The Check payment method will allow your attendees/registrants to pay for their event registration via check or money order. Need to Buy a Support License for Event Espresso 4? No installation is required. 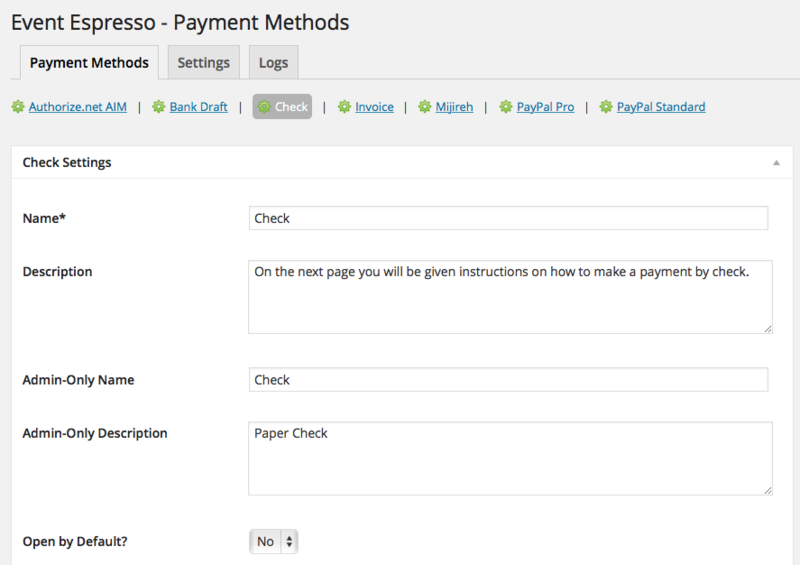 The Check payment method is included with the Event Espresso 4 core plugin. Login to your WP-admin (WP Dashboard) and go to Event Espresso –> General Settings –> Payment Methods. Once on the Payment Methods screen, click on Check and click on the button to activate the payment method. To give your audience more payment options, you can activate multiple payment methods at the same time. However, if you are offering just one payment option, then we recommend that you set that one payment method to be selected by default during registration checkout. That will simplify the check out process for your attendees. Title – This is the title of the payment method and appears on the registration checkout page. Instructions – Provide clear instructions for how a payment should be made. Payable To – This is the name of the organization or person that the check should be made out to. Address Payable – This is the address of the organization or person that the check should be made out to. The Check payment method will provide your registrants/attendees with information on how to send a check to pay for their event registration. It can also be used to handle payments via money orders. This is an onsite payment option which means that attendees/registrants will not leave your site. This is a payment method so no actual funds will be transferred via this payment option. I configured Check and payments are not being processed. Can you help? This payment method does not process or transfer actual funds (monies). You’ll need to provide instructions on how an attendee/registrant can pay (e.g. mail a check or money order to a specific address). This can be done by using the Instructions field on the Check payment method settings. When I refund a payment, does it also refund a payment automatically? Refunds in Event Espresso 4 are currently a two step process. First, apply the refund through the transactional details screen of Event Espresso in your WP-admin (WP dashboard). Then process a refund through the payment option that was used. For example, if an attendee/registrant paid via money order, then you would need to refund their payment through a new check or new money order. How can I setup a recurring payment or subscription through the Check payment method? Recurring or subscription payments are not currently supported through the Check payment method.